Running. That's all Ghost (real name Castle Cranshaw) has ever known. But Ghost has been running for the wrong reasons—it all started with running away from his father, who, when Ghost was a very little boy, chased him and his mother through their apartment, then down the street, with a loaded gun, aiming to kill. Since then, Ghost has been the one causing problems—and running away from them—until he meets Coach, an ex-Olympic Medalist who sees something in Ghost: crazy natural talent. If Ghost can stay on track, literally and figuratively, he could be the best sprinter in the city. Can Ghost harness his raw talent for speed, or will his past finally catch up to him? Jason Reynolds is a New York Times bestselling author, a Newbery Award Honoree, a Printz Award Honoree, National Book Award Honoree, a Kirkus Award winner, a two time Walter Dean Myers Award winner, an NAACP Image Award Winner, and the recipient of multiple Coretta Scott King honors. The American Booksellers Association's 2017 spokesperson for Indies First, his many books include When I Was the Greatest, Boy in the Black Suit, All American Boys (cowritten with Brendan Kiely), As Brave as You, For Every One, the Track series (Ghost, Patina, Sunny, and Lu), and Long Way Down, which received both a Newbery Honor and a Printz Honor. He lives in Washington, DC. You can find his ramblings at JasonWritesBooks.com. Reynolds (As Brave As You) uses a light hand to delve into topics that include gun violence, class disparity, and bullying in this compelling series opener. Seventh-grader Castle Cranshaw, nicknamed Ghost, knows nothing about track when a former Olympian recruits him as a sprinter for one of the city's youth teams. As far as Ghost is concerned, "whoever invented track got the whole gun means go thing right," something he learned firsthand when his father tried to shoot Ghost and his mother in their apartment three years prior. The trauma has had ripple effects on Ghost, including angry outbursts ("I was the boy.... with all the scream inside"), altercations at school, stealing, and lying. Joining the track team provides new friends, goals, and an opportunity for Ghost to move beyond his past. 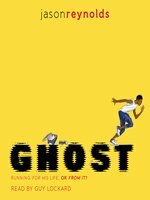 Ghost is a well-meaning, personable narrator whose intense struggles are balanced by a love of world records, sunflower seeds, and his mother. Coach's relationship with Ghost develops into a surrogate father-son scenario, adding substantial emotional resonance and humor to the mix. Ages 10âup. Agent: Elena Giovinazzo, Pippin Properties.